How to save 20 to 60 percent on health insurance! 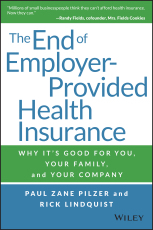 The End of Employer-Provided Health Insurance is a comprehensive guide to utilizing new individual health plans to save 20 to 60 percent on health insurance. This book is written to ensure that you, your family, and your company get your fair share of the trillions of dollars the U.S. government will spend subsidizing individual health insurance plans between now and 2025. You will learn how to navigate the Affordable Care Act to save money without sacrificing coverage, and how to choose the plan that offers exactly what you, your family and your company need. We are at the beginning of a paradigm shift in the way businesses offer employee health benefits and the way Americans get health insurance -- a shift from an employer-driven defined benefit model to an individual-driven defined contribution model. This parallels a similar shift in employer-provided retirement benefits that took place two to three decades ago from defined benefit to defined contribution retirement plans. Written by a world-renowned economist and New York Times best-selling author, this insightful guide explains why individual health insurance plans are a far better deal than employer-provided plans. That means a family of four can save $4,000 to $12,000 per year often for the same coverage: same hospitals, same doctors, and same prescriptions.